707 pages, 8.5" x 11", Full-Color & Black & White, English, 2015. Need a PDF reader? Click the icon to get Adobe's free one. For best results, "Right-Click / Save-As" PDF links. From the Preface: Approximately 35 percent of the world's population is less than 18 years of age. Many of these children require surgery each day. As a result, about 10 percent of all surgeries performed throughout the world each year are performed in this age group, which requires someone to provide anesthesia. For anesthesia to be safe, the anesthetist must understand the many physiologic and pharmacologic differences between children and adults. Providing anesthesia by a formula (giving a specific amount of a drug by some formula, e.g., mg/kg), as is often done, is dangerous and can be disastrous for some patients. Not all patients are the same and what works for one patient often does not work for another. It is the authors' belief and experience that administration of anesthesia must be given based on physiologic principles, not by a formula that is supposed to fit every patient. Where data are available, it is clear that the mortality of surgical patients is much higher when given based on formula than when it is given based on sound principles of physiology and pharmacology. Some of the topics and material presented in this book may be difficult to do or use in low income settings, but the concepts in these chapters can be applied to the care of many patients. Therefore, it is important for the reader to read and understand each chapter and to determine how to apply the information and concepts to their patients. 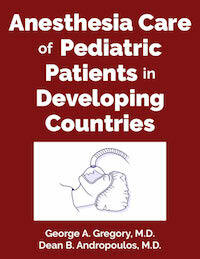 The purpose of this book is to provide information for anesthetists in developing countries who must anesthetize children but have limited access to pediatric anesthesia textbooks. All that is needed to access the contents of this book is access to a computer, and the internet. This book is available through several anesthesia society websites and commercial e-book companies. There is no charge for downloading the book from the website, and no purchase of the book from a third party is allowed. In many instances it may be appropriate for one person or a group of people to download the book and to reproduce it for distribution to other anesthetists. If this is done, please let us know how many copies of the book were made and distributed. This will help us know how widely the book is distributed. We encourage readers to translate parts of or the entire book into their native languages. Our goal is to update this material periodically, especially after feedback from people who use the book. Contact the authors at the following e-mail addresses: George Gregory (gregoryg@anesthesia.ucsf.edu); Dean Andropoulos (dra@bcm.edu) with questions and suggestions. These questions will be answered as promptly as possible. Also, if there are other subjects you would like to have covered in the book, please let us know at the same e-mail addresses, and we will add them if possible. As thanks for the free download, while you wait, please help us out by filling out a short, voluntary, and confidential survey. Global HELP provides a free, online medical library with a primary focus on children’s health in underserved communities. Global HELP is a 501(c)(3) nonprofit organization. Click here to find out how you can help us!